FILE - Congresswoman (then-Rep.-elect) Ilhan Omar, D-Minn., joins House Democratic Leader Nancy Pelosi of California and newly-elected members at a news conference to discuss their priorities in the 116th Congress at the Capitol in Washington, Nov. 30, 2018. Heated confrontations broke out in the West Virginia statehouse on Friday after the state Republican Party allegedly set up an anti-Muslim display in the rotunda linking the 9/11 terror attacks to a freshman congresswoman from Minnesota, NBC News reported. 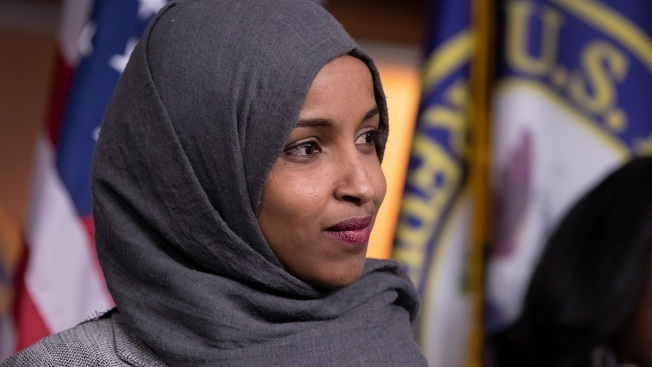 The display featured a picture of the World Trade Center in New York City as a fireball exploded from the one of the Twin Towers, set above a picture of Democratic Rep. Ilhan Omar, who's a Muslim. "'Never forget' - you said. . ." read a caption on the first picture. "I am the proof - you have forgotten," read the caption under the picture of Omar, who is wearing a hijab. One staff member was physically injured during the morning's confrontations, and an official resigned after being accused of making anti-Muslim comments.